My greatest strength as a researcher is the creation of interdisciplinary conversations about some of the most challenging political issues of our time, from cultural genocide and reconciliation to gambling policy, white nationalist movements and the challenges facing the neoliberal university. I apply this research expertise to facilitate public art and other knowledge transfer projects. In addition to producing a body of art writing for books and catalogues, I have curated, managed and produced media (including websites and film) related to whiteness, reconciliation and Indigenous sovereignties. In 2002 I curated a social history exhibition for the Liverpool Regional Museum on the life of Aunty Nance DeVries, a survivor of the ‘stolen generations’ of Aboriginal children and speaker to the New South Wales Parliament on the occasion of the Government’s apology in 1997. Working with veteran documentary photographer, Mervyn Bishop and videographer, Sandra Peel, I drew upon and exhibited extracts from a large archive of documents about Nancy’s ‘case’, from her birth up to the age of eighteen when she was released from institutions of state care. Titled Ten Hours in a Lifetime (a reference to the time spent with her biological mother), this exhibition was the most popular in the museum’s history, with thousands of school children attending tours while it was on site, before later travelling to the New South Wales Parliament House. In 2014-2015 I delivered a major project for the University of Queensland titled Courting Blakness: Recalibrating Knowledge in the Sandstone University. This project centred on the Great Court as the symbolic and material heart of the University of Queensland. Reflecting the University’s heritage, traditions and prestige, this gathering place and thoroughfare is also a space where images of Aboriginal people prior to, during and after the colonization of Australia are carved in sculptural reliefs. Curated by Fiona Foley, Courting Blakness entered a creative visual dialogue with these carvings. Works by eight Aboriginal artists (Archie Moore, Ryan Presley, r e a, Natalie Harkin, Megan Cope and Michael Cook, Christian Thompson and Karla Dickens) made the Great Court a unique staging platform for discussions about the relationship between Indigenous people and the University; the edited collection of essays published by UQP provides a permanent record of these discussions. While on site, it reached over 25,000 people, including 800 students across fourteen different courses through disciplinary specific frameworks of discussion and assessment tasks. It delivered staff training through public seminars and two university-wide ‘Diversity Discussions’ and provided over 1,000 hours of volunteer activity. The website attracted over 3031 unique users and was a valuable teaching, learning and research resource for the exhibition. It now forms a digital archive for future research on public art and universities. As convenor of the 2017-2018 Political Science Department Speakers’ series, I brought scholars to campus to reflect on some of the most difficult questions raised by the Canadian Truth and Reconciliation Commission. Speakers included Glen Coulthard, Audra Simpson, Jaskiran Dhillon, Robert Nichols, Jeremy Schmidt and Aileen Moreton-Robinson. I am currently producing a short film titled Afterlives of the Truth and Reconciliation Commission: What Comes Next? Directed by award winning Métis film-maker, Conor McNally, it will feature provocative research presentations by Indigenous and non-Indigenous academics and interviews with leaders of Prairie Aboriginal communities. The film will be used in classrooms and boardrooms to educate non-Indigenous people about the meaning and ramifications of ‘cultural genocide’ and current aspirations to national reconciliation. My research themes include: the politics of art and everyday life, reconciliation, Indigenous sovereignty, racism, public art, nationalism, whiteness gambling policy. Frameworks of analysis include critical gambling studies, critical race and whiteness studies, Indigenous knowledges and STS, theories of aesthetics and cultural history. The quality of my research is evidenced by the journals I publish in and in the journals containing articles that cite my work. Since beginning my career in the mid-1990s by publishing in Meanjin Quarterly, a prestigious Australian journal of cultural and literary criticism established in 1940, I have published in international cultural studies journals including New Formations, Communication and Critical/Cultural Studies as well as Australian academic journals Cultural Studies Review and Continuum: Media/Culture. Journals in which I have published on matters related to law and policy include Borderlands eJournal, Griffith Law Review, Australian Feminist Studies and the Journal of Law and Social Policy (in Press). Gambling is a site where risk, finance, and play converge in liberal-democratic societies with important consequences for individual and state economies. As Research Chair in Gambling Policy with the Alberta Gambling Research Institute (AGRI), I work to address some of the most urgent questions and intractable issues arising from this convergence. Some distinctive features of gambling policy in Alberta include: the direct involvement of charitable, religious and not-for-profit organizations; measures to address problems related to addictive products, including Game Sense centres on the floor of casinos to inform consumers as well as to manage self-exclusion requests; using lottery funds to enhance public utilities such as conservation projects, cultural institutions and sporting associations; supporting First Nation gambling enterprises; and developing public education campaigns to raise consumer awareness about the risks of different forms of gambling. When we extend our view beyond the province and the nation, new policy challenges emerge. The globalization of gambling industries has seen a proliferation of digital gambling spaces, products and practices, from the spectacle of eSports tournaments to the controversial embedding of ‘loot boxes’ in popular videogames. As responsibility for financial risk is increasingly devolved from state to individuals, boundaries between digital entertainment platforms soliciting gambling – on one hand - and commercial forms of interactive play – on the other - have become increasingly fuzzy. To successfully address these developments, and more, academic knowledge must be creative and responsive to sociocultural context, rather than contained within the medical and behavioural models of problem gambling that have previously informed policy. 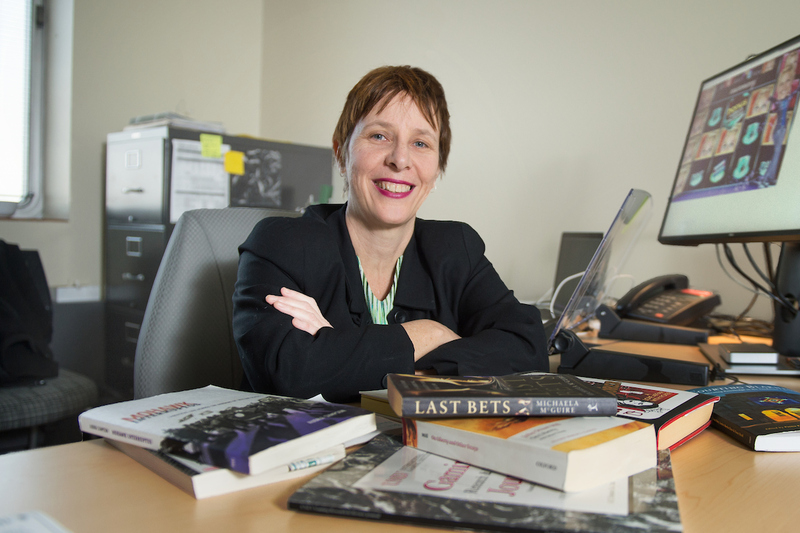 To identify and disseminate the best work by established and emerging scholars of gambling, I am working with co-editor and Killam Postdoctoral Research Fellow, Dr Mark Johnson, and other prominent scholars in the field to establish an international, interdisciplinary, peer reviewed journal of Critical Gambling Studies to be launched early in 2019. A founding member and first Vice President of the Critical Race and Whiteness Studies Association, I edited the inaugural issue of Critical Race and Whiteness Studies in 2005 which attracted contributions from leading scholars all over the world. I also co-edited one of the very first issues of the political theory journal Borderlands eJournal dedicated to critical theories of sovereignty in 2002 and an international collection of essays titled Transnational Whiteness Matters in 2008. My work is published in leading disciplinary and interdisciplinary journals and I have edited of several books and numerous journal articles and chapters, as well as creating and maintaining networks and publication outlets for emerging scholars in critical race and whiteness studies and critical gambling studies. I was one of a small group of non-Indigenous scholars chosen for inclusion in an edited collection of original essays titled The Aboriginal Tent Embassy: Sovereignty, Black Power, Land Rights and the State published by Routledge in 2014; my reflections on whiteness are included in George Yancy’s curated academic conversations titled On Race, a publication featuring prominent authors including bell hooks, Patricia Hill-Collins, Judith Butler and Cornell West. I also actively contribute to academic scholarship on race and whiteness in the neoliberal university. Timely case studies and engaging vignettes are used to connect readers to larger political arguments about social justice in the university, enabling students and instructors to recognize their own experiences. Some of this research is my most cited work. My article ‘Are You Calling Me a Racist? Teaching Critical Whiteness Studies in Indigenous Sovereignty’, published in borderlands ejournal is an often-cited example and is taught in several undergraduate and graduate courses in Australia and North America. Current research projects include: a survey of responsible gambling in Alberta led by Professor Garry Smith and Nerilee Hing (Central Queensland University); collaboration with Anishnaabe anthropologist, Dr Darrell Manitowabi (Laurentian University), Dr Mark Johnson and Indigespheres, a not-for-profit Indigenous development organisation directed by Sheila Wahsquonaikezhik, to explore how transnational gambling products and marketing are shaping involvement of youth in gambling and video-gaming; and a meta-analysis of gambling research from New Zealand, Australia, the UK, Canada and the United States between 1996 and 2016. This is an exciting and challenging moment for classroom teaching. While digitalized sources of quality knowledge have never been so abundant, these compete for authority with an ‘infoglut’ of politically and commercially motivated messages. It is not enough to simply defend the value of face-to-face teaching; we need to demonstrate the unique pedagogical value of relationships created in the classroom to students accustomed to retrieving sources and conducting their social relationships online. My curriculum juxtaposes canonical disciplinary texts with revolutionary scholarship while introducing students to durable theoretical frameworks and local sites of application. Helping students to navigate the resources and the politics of academic knowledge inspires the informed, critical and creative thinking required for the diverse career aspirations of our graduates. Gaming: The Politics of Play (POLS 470/515) prepares senior undergraduate and postgraduate students for positions in industry, policy and academic research. The Politics of Culture (POLS 404/571) explores urgent questions about ‘the work of art’ within frameworks developed by critical theorists to understand political struggles surrounding bodies and borders. These struggles include but are not restricted to race, disability, Aboriginality, space, asylum, gender and sexuality and the (post) human. I am committed to mentoring the next generation of researchers as a highly effective supervisor and convenor of research capacity initiatives. I regularly supervise honours theses in the Faculty of Arts and have a strong record of successful PhD student completions (13 and 3 current) as well as Masters by thesis completions (1 current) and I am currently supervising a Killam post-doctoral research fellow.